Good lighting is a key to create a good photograph. It is very challenging aspects of photography as well. It takes knowledge, many years of practice and experiment with the different settings and lighting environment to get master on proper lighting. Some photographers like natural light and others like to use studio strobe, some photographers love one kind of light effect and others prefer different setting. So, it's very hard to say which one is the best lighting strategy and the only way to find out is to experiment yourself and find out which works best for you. I am still a beginner and not in a position to judge anyone’s technique or favor one technique over the other. In my view, it all depends on the shooting environment and what kind of effect you want to get in your photograph. I have seen many photographers divided over the argument of using Direct flash vs Bounce flash. There are some cases you may want to use the direct flash and sometimes you don't want to use the direct flash at all. It also depends on under what situation you are composing the photograph. Most of the time, photographers do not want to use direct flash light for portrait shots because it may produce glare highlights and shiny foreheads due to the light coming out of the powerful source from the short distance which hits directly to the subject. In that case, there are many ways you can soften the light and give more natural look to the photographs. Photographers are practicing different techniques to soften the light which helps to reduce the shadows due to harsh light. Mainly, they use either flash diffuser or bouncing the flash lights using any bouncer (ceiling or any reflector). 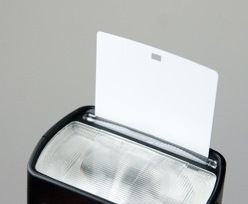 If you do not have the flash diffuser, you can make your own by using a small indexing card over the flash unit and tape it so that it bounces the light to the ceiling and reduce its intensity and producing soft and natural effect to the photographs. But when using bouncing light, you have to be very careful about the surface from which you are bouncing the light because the bounced light will pickup the color of that bouncing surface which directly affects the photograph. While preparing for this post, I took two shots very quickly. One with the direct flash lights and the other using the bouncing light. In both cases I used off camera flash Nikon SB-600 and fired it from angle. First, I applied direct flash to the subject and the second time I bounced the flash light using the white ceiling surface over my head. In this particular situation, I think bouncing the light worked better than hitting the subject with the direct flash light. When the light was bounced, its intensity was decreased and soften the light on the subject. Also, the bounced lights coming from the various angles helped to remove the shadow of the subject. In my opinion and generally speaking, photographs look more natural with the soft bouncing light than with the direct harsh light producing unpleasant highlights and shadows. But if you do have any different ideas or thoughts, please feel free to share it with us.